Do you meditate? Have you ever tried? I look like this. Obviously checking my Twitter feed. 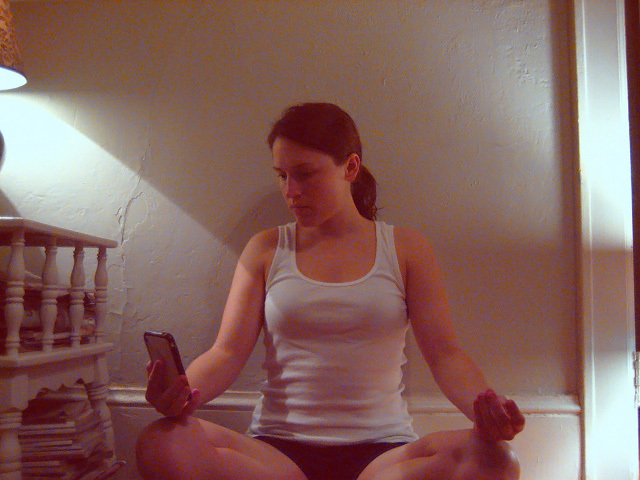 Even though meditation is very challenging for me, I am nevertheless intrigued. I came across this fascinating Yoga Journal article on meditation. It’s fairly long, but I hope you will at least give it a browse. I like the title “Your Brain on Meditation”, reminds me of those drugs commercials back in the day. Anyway, back to the article and seriousness. You know how we say, “You are what you eat”? Well researchers studying meditators versus non-meditators are proving that our brains “are what we think”. Confusing? I’ll explain. I think this is incredible. Basically, you can focus on any change you wish to make. With enough meditation, you alone can change the structure of your brain. This change may translate into better self-control or attention or self-love. Almost seems too good to be true, right?! Consider giving meditation a shot. Work in a few minutes each day–consistency is the key–and pay attention to your level of patience, self-acceptance, and energy.